Lisa Romeo was born and raised into privilege. She had show horses and competed nationally, traveled with her family first class around the world, and was always better dressed than any of her contemporaries. Her father had been a polyester magnate back when these synthetic fabrics were popular, though now we mock and eschew garments creatively made from that form of plastic. But not back then. Lisa's gilded life is no longer. Today she is a writer, wife, and mother of two sons who lives frugally to make a good but not prosperous life for herself and her family. This memoir spans but a few years in Ms. Romeo's late forties, though of course looks back. Her elderly father, living comfortably in Las Vegas with her mother, falls ill. He develops disabling arthritis, Alzheimer's, and then has a stroke. Getting old, as has been said, is not for the faint of heart. Her brother, living locally bears the brunt of the father's decline, while Lisa and her East Coast sister try to help from afar. Lisa holds highly complex and ambivalent feelings toward her father, who while materially generous was distant and given to having the last word. Her father was known to all as Tony Chip (Anthony Chipolone). She tells us he looked like Errol Flynn, dressed stylishly, and tipped expansively. He always had smart counsel for everyone, despite a 10th grade education. Maybe he had high functioning Asperger’s Syndrome (now considered on the Autism spectrum), she suggests. Then he dies. And so begins Romeo's story of losing and finding her father. The book is a well-crafted, eloquently written, extended eulogy. 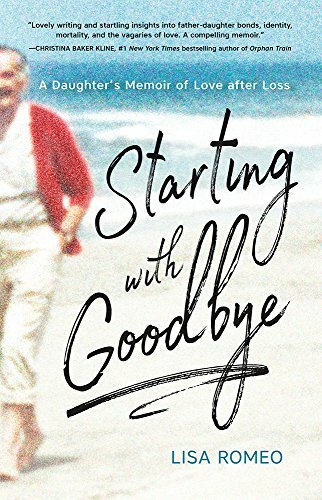 There is a lot that is sad here, and highly revelatory of an author who has the courage to disclose what she regards as her faults and failures. There is no peace for her until she travels the journey of grief. It helps to believe in ghosts to be open to the visits her father begins to make to Lisa after his death. Little is usually said. He appears as his able, accomplished self. These reveries, if that is what they were, catalyze Lisa's feelings not just about her dad but about herself. In other words, the visits—and the feelings they prompt—are redemptive. The author quotes Paul Auster, " I had lost my father. But at the same time, I had also found him." Lisa, also, found her psychic freedom and self-acceptance, which had theretofore eluded her. Grief, as the author tells us, is not about forgetting. It is about remembering. The treatment for grief, particularly persistent or unresolved grief, is conjuring up memories, unearthing the past, with its kaleidoscope of emotions. Only then can the heartache be mitigated, a lost and pained relationship be mended, a life propelled forward.